Space Reservations and Events page. 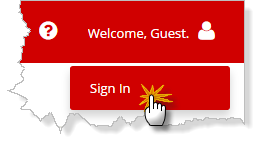 Click Welcome, Guest in the upper right and then click Sign In. You'll be required to sign in via your campus credentials before you have the option to create a reservation. Please be advised that your reservation request is not guaranteed until you have received confirmation of your reservation.